Brocka Rose (Photo 1) is a 1/2 sister of CSI5* 1.60m International Showjumper Hello Max (photo 2&3)who won the 1.60m Global Champions Tour Hamburg Derby at the age of 19 with German rider Gilbert Tillmann in 2013! She is also a 1/2 sister to the International eventer Champeix Star. She is by Olympic Lux who has bred numerous top 1.60m international showjumpers including one of the top ranked Irish showjumpers Cos I Can. Olympic Lux is by the well known 1.60m International showjumper Lux Z who has also produced numerous top international showjumpers. 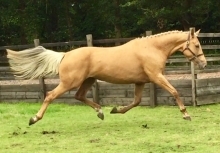 Olympic Lux has a very strong damline which includes the 1.60m jumper Ahorn and the foundation sire Furioso. Brocka Rose’s dam is by the TB I’m A Star who has produced numerous top Event horse including Star Appeal – Winner of Badminton and Burghley with Mary King and Moon Man(photo 4) – winner of a World Cup Qualifier with William Fox Pitt. Brocka Quinn(photo 5) 1st in the BYEH qualifier at Badminton and 2nd in the final at Burghley. LSS Martinique(photo 7) now in the Uk to pursue her career. Brocka Rose is currently in foal to Premier Sport(photo 8) and is due to foal April 2018. Premier Sport is an International Grand Prix Horse 1.40m with numerous wins including the Millstreet International CSI3* Speed Derby 2016. 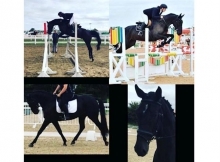 He is very well bred being by Touchdown who competed at the Barcelona Olympics and has bred numerous top international showjumpers and eventers. Premier Sport’s dam is Cavalier KD by Cavalier Royale. She is a prolific producer of show jumpers like her sire Cavalier.